Utopia, the Library and Academy for Performing Arts, is situated on the corner of Oude Graanmarkt and Esplanadestraat in Aalst. 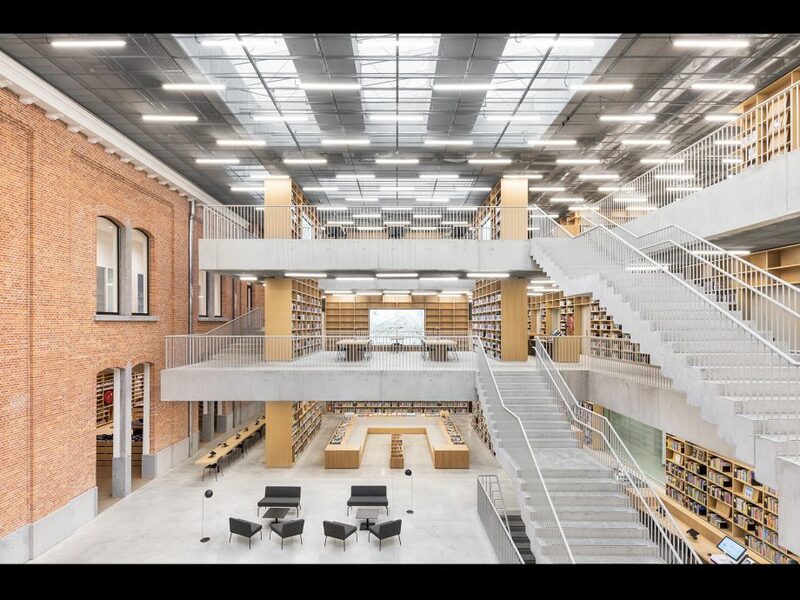 The 8.000 square-meter brick structure incorporates a striking historic building from the second half of the Nineteenth century, the so-called Pupillenschool, and rejuvenates the urban landscape while elegantly giving expression to the required functionality. Both outside and inside, the historic façades blend perfectly with the generous spaces, while the brickwork dialogues with light gray concrete elements. Taking its cue from Thomas More’s acclaimed book “Utopia”, first printed by prominent Aalst citizen Dirk Martens, the new building has a functionally driven plan in order to achieve a sense of spatial freedom and it has been slotted into the urban fabric to enhance the characteristic irregular streets and intimate spaces of the city center.